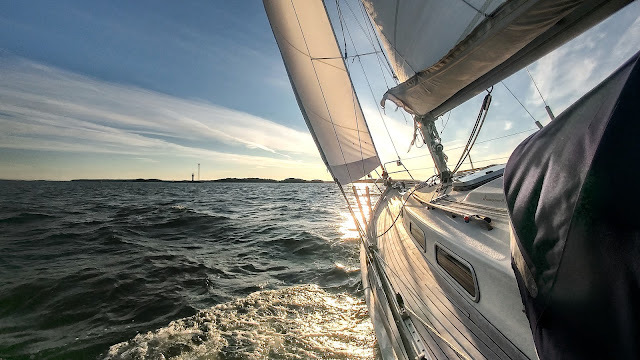 I wrote earlier a blog post on bow anchor selection. Last week I lowered the anchor and all the chain to the pontoon to check the condition of the chain and to improve the length markings. It turned out that the anchor chain was 40 meters long and not 30 meters as I had previously recalled. The chain weighs probably well over 1 kg per meter, so it is a heavy lump in the bow. Furthermore, I think that our 20kg CQR-anchor is a bit over-sized for a 29ft boat and it is often seen in boats over 40ft. Therefore I decided to order a new 10 kg Delta-anchor which arrived today, just in time. 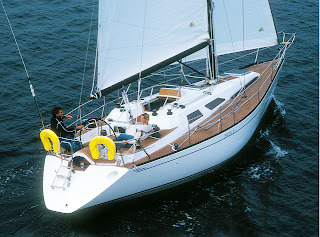 Delta's fluke has a plowshare shape similar to the CQR-anchor and both anchors are nowadays manufactured by Lewmar. However, perhaps the most important difference is the hinged shank in the CQR, which makes it cope better with windshifts. Also the shank is longer in the CQR. The Delta is a more recent design, and it has some benefits. Its shank is shaped so that the anchor will self-launch from bow roller when released. The tip is ballasted to give a low center of gravity, which should make the anchor set more quickly. Delta is basically a modernized, fixed shank version of CQR. Testing how Delta fits to the bow roller. I haven't fitted the Delta yet, but one potential problem might be, that the roll-bar, which we use as a step, appears to be higher. Not sure if it is because of its shape or just because the new anchor is smaller. If anyone is interested in our old 20 kg CQR, feel free to contact: sydolphindance(a)gmail.com. The legendary CQR-anchor is guaranteed for life against breakage in use and Lloyds rated High Holding Power anchor.